Daughters are popular right now. Novelists are smitten by them. I first took notice of the trend when Amy Tan published The Bonesetter’s Daughter a few years ago. It was a year after the non-fiction world was introduced to Galileo’s Daughter by Dava Sobel. I was briefly side-tracked by The Time-Traveller’s Wife (Audrey Niffennegger) and an old copy of The Beekeeper’s Apprentice (Laurie King), but the steady release of books about one person or another’s daughter continued unabated. 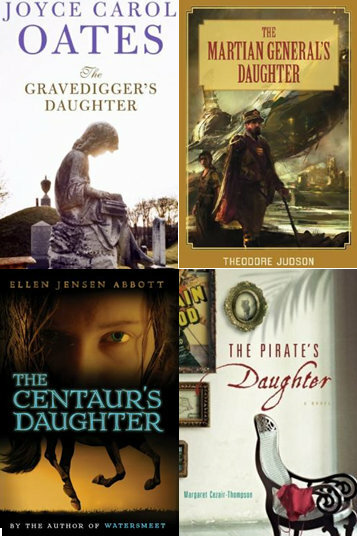 Consider this progression: The Traitor’s Daughter leads to The Hangman’s Daughter, The Bonesetter’s Daughter, The Mortician’s Daughter, The Gravedigger’s Daughter, and finally The Grave Robber’s Daughter. There are daughters of presidents and preachers, heroes and inmates, samurais and martian generals, hummingbirds and centaurs. I even encountered The Gerbil Farmer’s Daughter! I don’t know why this female offspring phenomenon has taken root, but The Bookseller’s Daughter is surely grateful. Do you think I’m imagining it? I ran a search of my local library’s catalog and turned up these books published in the last ten years.